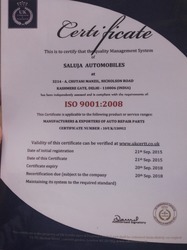 Saluja Automobiles, began its operations in the year 2000, as one of the finest Manufacturers and suppliers of this diverse and impeccable range of Automobile Parts. This highly commendable range is made up of the finest Oil Seals, Tie Rod and Ball Joint. Which are widely demanded in the market. Manufacturing of this range is done as per the set industry guidelines and norms, utilizing quality raw materials and advanced machinery. This ensures the range’s durability, resistance to corrosion, finishing, sturdiness and dimensional accuracy. Further, the range is marked at the most reasonable rate possible. The infrastructural facility at Saluja Automobiles is Developed on a highly regular basis, to help us in the boosting of our presence in the market and maximize our production capacity. The facility equipped with all the necessary machinery and equipment, facilitates the attainment of several of the predefined organizational goals and objectives. For managing the firm’s operations in the best possible manner, we have parted it into several units. Further, our ethical work practices have attracted reputed clients South Africa, Asia and Europe towards us. Under the guidance and leadership of Mr. Daljeet Singh, we have achieved great heights of success. His managerial skills, ability to handle pressure and make impeccable decisions, have been one of our most valuable assets. Our highly able and hard working team of professionals helps us in the attainment of several of the firm’s predefined goals and objectives, in the smoothest possible manner. Recruitment of these professionals is commenced on the basis of their skills and past experiences. To keep these professionals at par with the ever changing market, regular training sessions are provided. Further, to manage their operations in the best possible manner, the team has been parted into a number of highly operational units. We are amongst the leading exporters, manufacturers and suppliers of this highly commendable and wide range of Automobile Parts. To maintain this market standing, we engage in the utilization of high grade raw materials and modern machines, in compliance with the set industry norms and guidelines. This ensures the product’s finishing, durability, resistance to corrosion and dimensional accuracy. In addition to this, the offered range is known to be marked at the most reasonable rate possible and id delivered in the timeliest manner.